The MMR Vaccination Debate: Is the Vaccine Effective? There seems to be an all-out war against people who aren’t vaccinated or don’t vaccinate their children versus those who stand staunchly on the pro-vaccination side. Some believe the unvaccinated get infected and spread the disease; they believe the non-vaccinated caused the Disneyland outbreak. Others argue that the vaccinations spread the disease and cause vaccine-related injuries. It is also thought that the MMR (measles, mumps, rubella) vaccination may not even work. In a study published in the world-renowned peer-reviewed journal PLOS ONE last year, researchers analyzed 1,015 people from Zhejiang, an eastern coastal province of China with a population of 55 million. In total, 99% of the people received an MR (measles and rubella) vaccination at eight months of age and the MMR vaccination at 18 to 24 months after birth. Measles is a serious and contagious infectious disease—there is no debate there. Some common symptoms include a hacking cough, runny nose, fever, white spots inside the mouth, and irritated or watery eyes. It may take up to two weeks before symptoms show up. After several days, a red rash will begin to erupt, which starts around the neck and head, spreading down the body. The skin will peel when the infection clears after four to seven days. In some young patients, untreated measles cases can lead to complications like ear infections, diarrhea, and pneumonia. On rare occasions, the development of a brain-swelling condition called encephalitis or death may occur. How Can Homeopathy Eradicate Measles? Conventional medicine recommends the preventative MMR vaccination; however, not every doctor agrees. 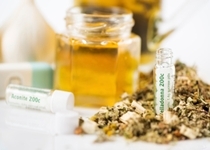 Naturopathic doctors and homeopathic practitioners will regularly prescribe homeopathic remedies as a safe treatment or preventative method for infections caused by the measles virus, among many other serious conditions. Homeopathy has had success with treating the measles for more than 200 years, and it can help rebalance a person’s energy. The best homeopathic remedy will depend on the exact symptoms of the person. As always, it’s best to consult with a trained homeopath or naturopathic doctor who is well educated in homeopathy, in addition to educating yourself when it comes to the following homeopathic remedies for the measles. After the first sign of measles symptoms, Aconitum napellus may be prescribed. Symptoms to watch for prior to this homeopathic treatment include strong thirst, eye pains, high fever and dry skin, light sensitivity, teeth grinding, red tongue, and restlessness. The person’s symptoms will often start around midnight. This remedy is best after a rapid fever with hot skin, a flushed face, throbbing headaches, and dilated and sensitive eyes. The person’s red rash will often be hot and painful. Rest will make the condition better; however, noise, drafts, and jarring will worsen the condition. Euphrasia is often prescribed during the early stages of the measles, when the eyes are sensitive to light and stickiness and conjunctivitis (pink eye) are also a concern. The person’s tears will also cause irritation, and headaches will be intense. This homeopathic remedy is best when the patient experiences measles symptoms gradually. Drowsiness, shaking and chills, lethargy with a fever, and an itchy, hot, and dry rash are the specific signs that gelsemium is likely the appropriate homeopathic remedy. Pulsatilla is often the measles prescription when a rash develops slowly. The person may also have a cold with a stuffy nose, cough, and ear inflammation. They may also be quite needy, requiring a lot of attention and comfort. The homeopathic remedy sulphur is best for someone with a slow-to-develop rash. Once a rash does appear, it will be purple, rough, and very itchy. Other symptoms may include a fever and chills, and patients may experience side effects like diarrhea, chronic coughs, and ear infections. Where do you find homeopathic remedies? The average health food store will carry most varieties of homeopathic remedies. Talk to your homeopath if you have troubles finding a particular remedy. Locke, A., Encyclopedia of Homeopathy: The Definitive Home Reference Guide to Homeopathic Remedies and Treatments for Common Ailments (New York: DK Publishing, Inc., 2000), 252–253. Hershoff, A., Homeopathic Remedies: A Quick and Easy Guide to Common Disorders and Their Homeopathic Treatments (New York: Penguin Putnam Inc., 1999), 214–215. “Homeopathic Remedies for Measles,” TrueStar Health web site; http://www.truestarhealth.com/Notes/2239004.html, last accessed March 9, 2015. Wang, Z., et al., “Difficulties in Eliminating Measles and Controlling Rubella and Mumps: A Cross-Sectional Study of a First Measles and Rubella Vaccination and a Second Measles, Mumps, and Rubella Vaccination,” PLOS One 2014; 9(2): e89361, doi: 10.1371/journal.pone.0089361. Malerba, L., “A Practical Alternative to Measles Hysteria,” GreenMedInfo web site, February 16, 2015; http://www.greenmedinfo.com/blog/practical-alternative-measles-hysteria. “Complications of Measles,” Centers for Disease Control and Prevention web site; http://www.cdc.gov/measles/about/complications.html, last updated February 17, 2015. Ji, S., “Why Is China Having Measles Outbreaks When 99% Are Vaccinated?” GreenMedInfo web site, September 20, 2014; http://www.greenmedinfo.com/blog/why-china-having-measles-outbreaks-when-99-are-vaccinated-2, last accessed March 16, 2015.